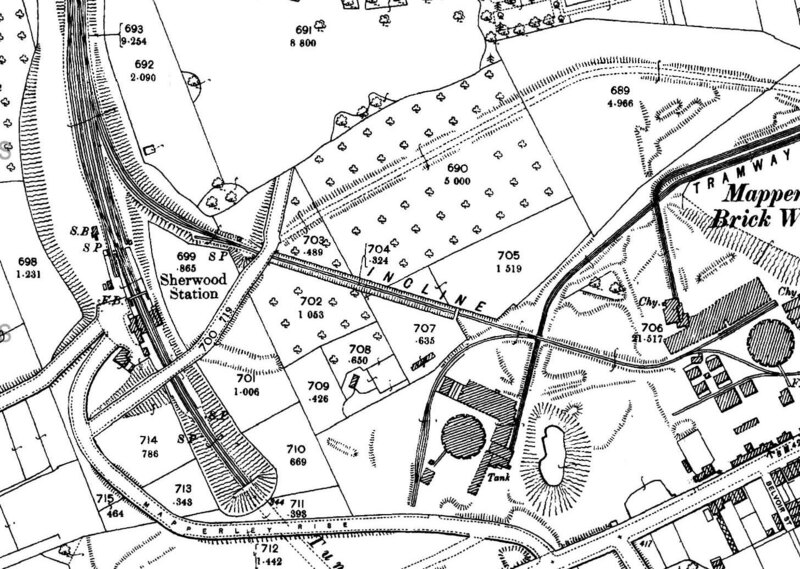 1900 1:2,500 OS map shows the layout of the station and goods yard. The station fronts onto a forecourt at the end of Mapperley Rise. The main station building is seen on the down side with the stationmaster's house at the end of Mapperley Rise. The lamp room, which also acted as a Porters' room, is at the back of the down platform immediately north of Sherwood Bale Bridge. The two platforms continue in the cutting on the south side of the bridge; the north portal of Sherwood Tunnel is at the end of the cutting. The entrance to the goods yard is from the forecourt, with a weighbridge and office shown just inside the entrance at the back of the cattle dock which is seen behind the north end of the down platform. Sherwood's 30-lever signal box is seen just north of the dock. The yard comprises two parallel loop sidings from which a short siding runs into the dock. On the down side there are two exchange sidings, one running to the north end of the up platform. There is an end-on connection with the rope-worked incline to Mapperley brickworks. A second bridge over Sherwood Vale is seen at the bottom of the incline. Ascending and descending trucks were controlled from a small brick-built hut seen to the east of this bridge.